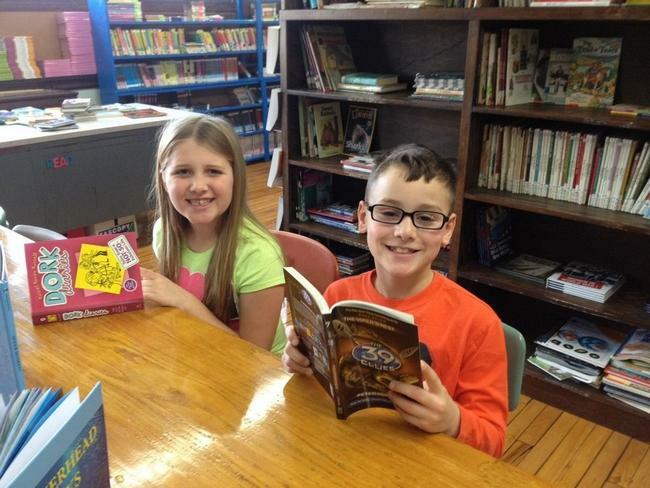 SWANSEA — Copies of “Diary of a Wimpy Kid” practically flew off the shelves and into the eager hands of the third graders at the Luther School Friday morning. Caetano and the other children chose their books carefully from the new Luther School Library. The library opened a couple of weeks ago in a classroom on the second floor, after having been closed for years. Luther School Principal Sean Scanlon, who took the helm for the new school year, said it was a goal of his to reopen the library. Since the summer, Scanlon, along with teachers and parents, especially Laura Zorra, have worked to fill the shelves with books for children in grades 3 to 5. The Luther School educates children in just those grades, while other schools in town have students in the lower grades. Each class will visit the library every other week and make their own book selections. Parents have volunteered to help the kids and assist them in checking books in and out of the library. Scanlon said they’ve spent about $1,500 on new books and are still beefing up certain sections of the library. “A few hundred have come in,” Scanlon said. Another shipment of “Diary of a Wimpy Kid” is on the way. Student Byron Bell chose “Diary of a Wimpy Kid” to read, as did Hannah Santos.